The POS Software System ROBOTILL now supports Price Modes. 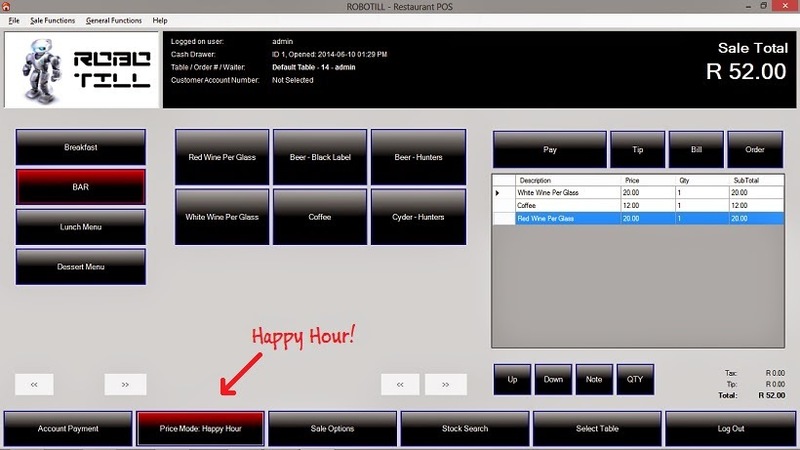 Price modes can be configured and be used for things like 'Happy Hour'. While in the special price mode, the price mode button will remain red and indicate the active mode. The Price Mode feature is available in the Restaurant POS Module and the Retail POS Module. The Price mode will change all the prices to second or third tier prices and can be applied for a period (over several sales) or for a specific sale. The Print Design screen has been improved to allow for easier design in larger size papers. The Price Maintenance and Specials is now easier to use. A Hot Key for price changes was added. Customer VAT Number added to 'Till Slip with account payment'.